Aftermath of Cyclone Nargis in early May 2008, some volunteers organized by Buddhist monasteries reached out to the cyclone victims almost unreachable villages (at that time) located along the coast of Burma’s delta regions. Messages came to me that villages lost their drinking water ponds. The storm surges washed away and flooded the village ponds with salt water. 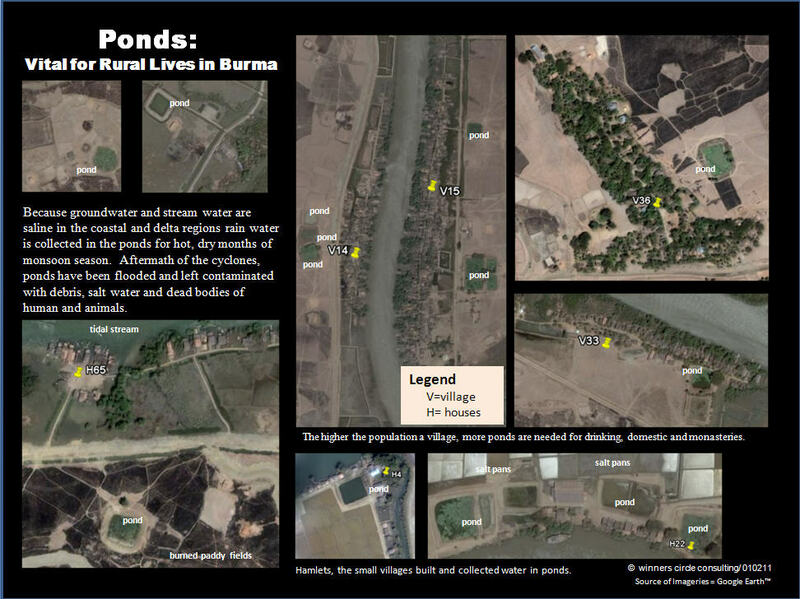 In some places, water in the ponds was contaminated with debris as well as the dead bodies of animals and human. Drinking water ponds are vital for every rural Burma because of the shortage of water during the dry months of monsoon season. In the Arakan (Rakhine) and Tenasserim (Tanintharyi) coastal regions and the delta regions of Lower Burma such as Irrawaddy (Ayeyarwady) and Rangoon (Yangon) divisions, rain is abundant in the rainy season for four months, and then the dry season sets in as temperature raising higher and higher every day during the summer months, leaving local hand-dug wells dry. Groundwater in the soil is normally saline. Creeks, streams and rivers are around, but they are tidal streams and water in there is saline. Therefore, ponds are dug, and stored fresh rain water in there. Even a smallest village needs a pond. Many communal ponds are built as a village is in linear shape, or larger. Traditional, smaller ponds are built for the monasteries which provide drinking water when water is scarce for the villagers, and for those villagers who wish to set free of fish as a religious merit. 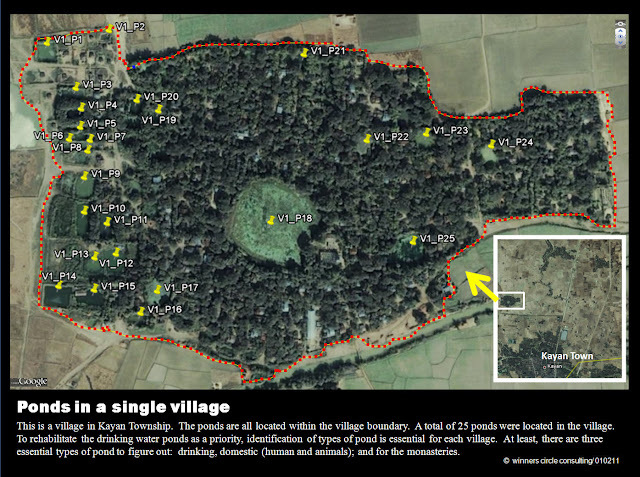 Therefore, more than a single pond can be found in the villages. The following satellite image depicts an exceptional single village holding 25 ponds in Kayan Township. The World Vision reported recently that more than 300 village ponds have been rehabilitated two years after Nargis hit the region. In fact, more than a thousand of village drinking water ponds were damaged. I believe that digging of some new wells or new ponds were replaced or abandoned the old damaged ponds. 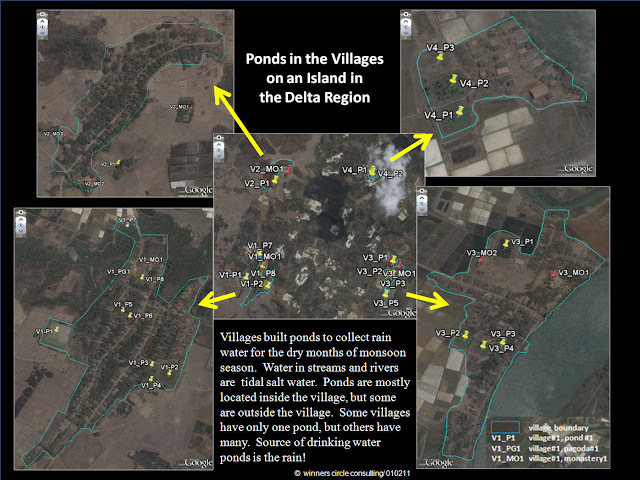 Regardless, help is still needed for rehabilitation or construction of permanent communal village ponds. 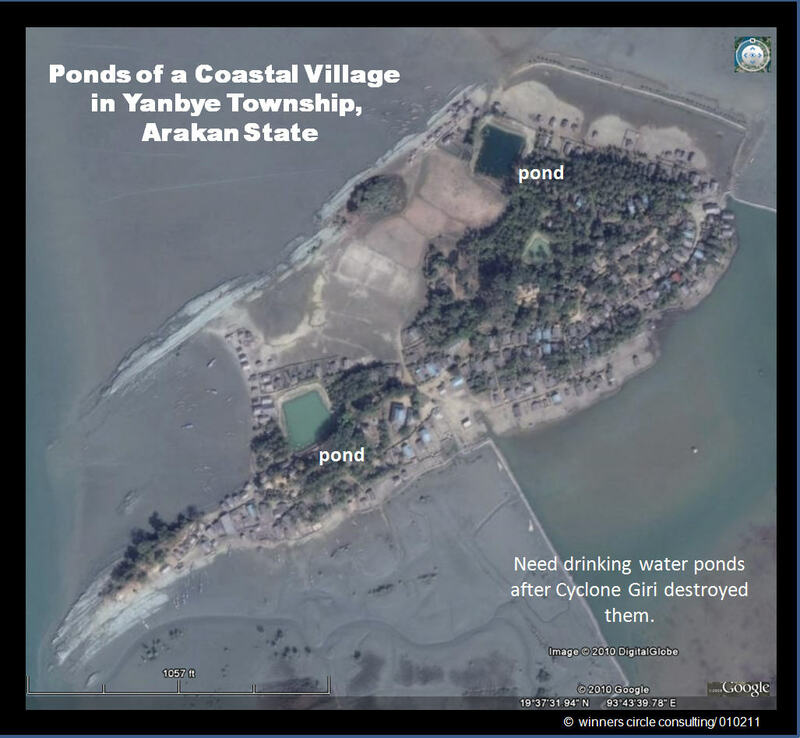 Please don’t forget that village ponds in Arakan (Rakhine) State that were damaged by Cyclone Giris just recently. 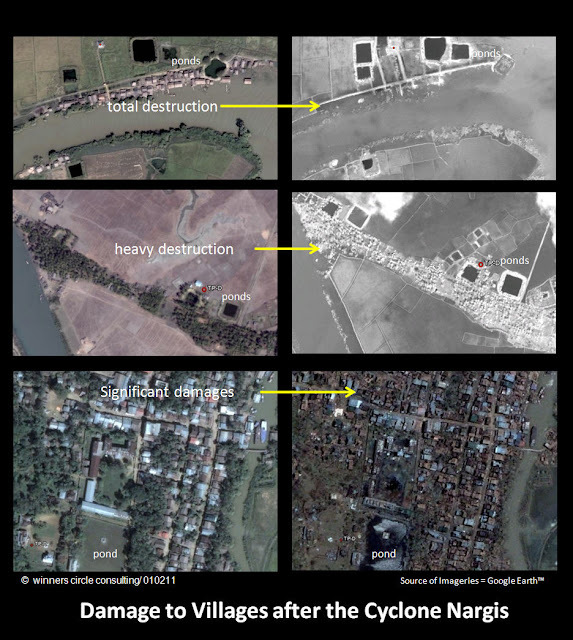 As you know, the Burmese military regime has been reaping the billions dollars from the oil and gas contracts with foreign companies, the money is kept for their personal account and military expansion to hold power in Burma; but not for the people who needs essential drinking water in these villages. There are some local organizations associated with Buddhist monasteries and NGOs who are effectively help making for donations work for this effort. I sincerely request the potential donors to assist and help them for this particular need: drinking water ponds for the villages.